From humble beginnings, Boston’s restaurant scene is fast developing a national reputation. Celebrities like Julia Child and Ming Tsai have added star power to the city for decades, and local favorites such as Mike’s Pastry and Legal Sea Food attract tourists by the droves. Now, the next generation of restaurant innovators is changing the face of Boston dining through technology like never before. As Sam Hiersteiner writes, “economic growth, a rising crop of young talent, burgeoning ethnic communities, and culinary innovation from the likes of MIT and Harvard are all contributing factors working in [Boston’s] favor.” Providing restaurateurs with a supportive environment to bolster business development, this primordial soup continues to nurture new ventures in a virtuous cycle of innovation that benefits newcomers and veterans alike. In an industry where the average profit margin is 3.7%, Boston innovators lay the groundwork for a whole new restaurant experience. Most entrepreneurs seek outside help as they translate ideas to concrete business and profit. One resource in Boston is the Epicenter Community’s Restaurant Discovery Pipeline, which secured 76 liquor licenses costing up to $450,000 in an effort to make restaurant ownership more accessible for urban entrepreneurs. Dorchester-based Snapchef, the largest culinary training and staffing company in New England, connects culinary experts with major employers. Restaurateurs can even turn to RealFood Consulting, a firm that specializes in the food industry. Under president Ed Doyle, RealFood advises on business model, design, and operations, among other aspects of ownership. Boston’s famous universities are a launchpad for aspiring restaurateurs. BU’s School of Hospitality Administration immerses students in the working world, providing a background in the industry before they even graduate, and the Distinguished Lecture Series, along with similar university-run programs, brings in hospitality experts and innovators to push and inspire students. The organization Future Chefs helps urban high school students transition to careers in the culinary world, and in Brookline, the Restaurant Entrepreneurship Institute develops practical, creative thought through industry training. A large number of restaurant tech startups call Boston home. Toast, a point of sale and management system, serves F&B establishments nationwide. The Reserve app helps users discover and book restaurants, and Allset goes one further, making it possible to actually order online. These companies have used Boston as a launchpad and are now available in major cities across the country. Lunchsmarter is a subscription-based order ahead platform for corporate employees that offers a daily curated meal selection, and the staffing service Jobletics embraces the high turnover rate of the food industry -- users can hire foodservice professionals as little as three hours before shifts start, or find employers through the portal. ezCater, the only nationwide corporate catering marketplace, was founded in Boston ten years ago, and Fooda, another catering service, connects with companies and F&B establishments to host pop-up restaurants and employer-paid lunches. One of their partners is Rootastes, a seasonal Thai caterer that implements an online ordering system. Alchemista offers corporate snack room stock and meal programs, and hot on the heels of the Boston food truck initiative, Food Truck Stars helps hungry users locate trucks in their area. Whether front or back of house, food service innovators are using technology to reinvent the future of dining. Investing in new restaurants is notoriously risky, but Boston is home to organizations that specialize in the industry. The Restaurant Investment Group vets prospective candidates, who meet with consultants while retaining ownership and creative control. Bessemer Venture Partners invested in Blue Apron in 2013, and led a $30 million financing round for POS system Toast, later contributing to an additional $101 million round in 2017. On the designing side, retail development and urban planning firm Graffito SP has placed many F&B establishments in greater Boston, working extensively in the Kendall neighborhood of Cambridge. Cafco, a contracting company that specializes in the hospitality industry, helped acclaimed establishments such as the Row 34 and the Kirkland Tap and Trotter create on-brand interiors, while the design firm studioTYAK takes advantage of the individual history and context of spaces to embrace the personality of establishments such as the Sinclair. Successful Boston restaurants, fueled by the entrepreneurial spirit of the city, expand and give back to the F&B community in a virtuous cycle. After growing up in Southie as Whitey Bulger's neighbor, famous chef Barbara Lynch now has several acclaimed restaurants and established the Barbara Lynch Foundation to improve nutritional and culinary education in Boston. In 2012, the Barbara Lynch Gruppo partnered with MIT-born food tech company SproutsIO, which produces soil-free, smartphone-operated gardening systems. Similar restaurant innovation can be found everywhere in Boston. Henry Patterson, founder of Bel Canto and mentor to some of the city’s most successful restaurateurs, pioneered “open-book” management, a system which incorporates staff into bookkeeping and has been adopted by several establishments in the Boston area. The simple switch has increased profits, notoriously thin in the restaurant industry, and rewarded low paid staff with bonuses. The ArtScience Culture Lab and Cafe combines food and chemistry, featuring experiments like “Le Whaf,” which turns liquids into vapors you “drink” from a straw. Clover FoodLab, a fast casual place which sources from local farms, treats each dish as an experiment, even well loved classics. Their most famous, the chickpea fritter sandwich, has gone through over sixty iterations. CEO and founder Ayr Muir says, “[the] menu is in constant development. We make mistakes all the time. We work hard to make sure those mistakes are cheap, and that we learn from them.” That approach is paying off -- in under a decade, Clover has transitioned from one food truck on the MIT campus to thirteen brick-and-mortar locations in Greater Boston. Drawn to the emerging culinary force in the North, New York establishments such as Sweetgreen, Dig Inn, and the Halal Guys expanded to Boston before any other city. Mary Dumont, a Food and Wine “Best New Chef,” says, “New York chefs are trying to open new restaurants here now instead of the other way around.” With so much energy surrounding the F&B industry, Boston is quickly becoming the next big city for restaurateurs to conquer, and square one for countless exciting new ventures. At Branchfood we aim to raise awareness about Boston as a leading food community. 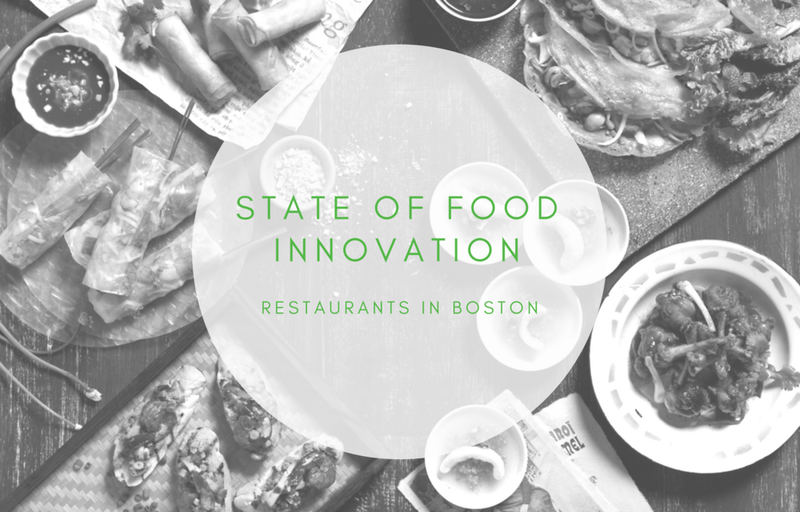 This blog post is the second in a series on innovation in Boston’s food and beverage industry. Written by Chloe Barran.